SumatraPDF Portable is a lightweight, tabbed document reader for a variety of formats. Includes a wide variety of views including table of contents, rotation, facing pages, book view (2 pages side-by-side), full screen, and presentation mode. Includes support for bookmarks, command-line arguments, hotkeys, and more. Additionally, Sumatra can function as a portable browser plugin. Supported formats include PDF, CBR, CBZ, CHM, DJVU, EPUB, FB2, MOBI, PDB, XPS. It allows you to view PDF files using any Windows PC. You can put it on your USB flash drive, portable hard drive or iPod and use it on any Windows computer, without ever leaving any traces behind. Sumatra PDF is an application that enables you to view PDF files, without requiring any third-party components. Since this is a portable tool, installing it is not necessary. Your Windows registry keys will remain intact and you can also place Sumatra PDF Portable on a removable device and always have it with you when you're on the go. The user interface of the program is plain and simple, although the default background color (yellow) can be a little disturbing to the eyes.You can open a document by using the file browser or the "drag and drop" method. 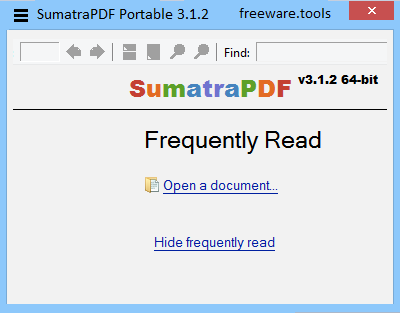 Sumatra PDF Portable can handle files in the PDF, XPS, DjVu or CHM format (including comic books). Thus, you can visualize document properties (e.g. date of creation, PDF producer and version, page size), as well as toggle the viewing mode between single page, facing, book view, "Show pages continuously", presentation and full screen. Also, you will be able to change the orientation (left and right), go to a particular page, search for text and zoom (e.g. fit page, actual size, fit width, fit content, custom). Furthermore, you can create a favorites list, change the interface language, disable the program to automatically check for updates or to remember opened files, as well as change the default layout and zoom. Sumatra PDF Portable uses a low amount of system resources, can guide you to an online user documentation and didn't freeze or crash during our tests. All in all, this application is great for viewing PDF documents and we strongly recommend it to all users.